I have a lot of favorites in this post. 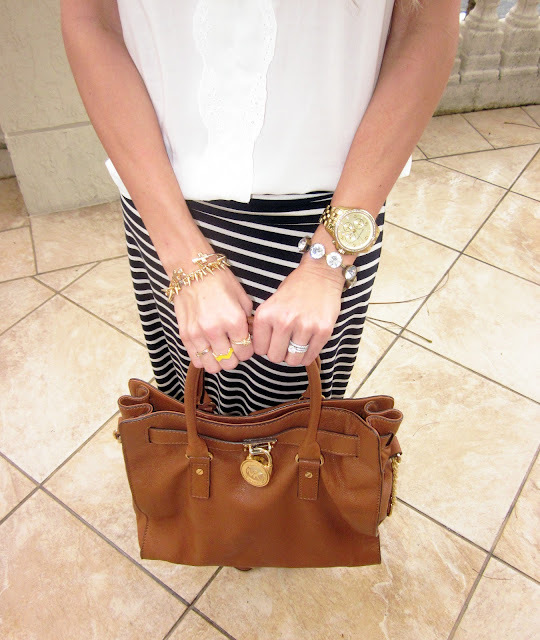 First this new J.Crew maxi skirt! I got it last week and have already worn it 3 times! Oops! It goes with everything and is so comfortable and easy to wear! These Michael Kors sandals. I wear them all of the time. I am thinking I need to get them in another color since I get so much use out of them. My Michael Kors Hamilton Bag. This bag is a staple in my wardrobe. And last but not least my ILY Couture Bubble Necklace. Who doesn't love a statement necklace?! If you haven't checked out ILY Couture you really should. They have amazing jewelry, for great prices. I have this necklace in 3 colors! Love the white, black and yellow combo!! I love the stripes with a pop of yellow. You have an amazing sense of style! I enjoy reading your blog. LOVE YOUR STYLE!! GREAT BLOG!! can we follow each other? ?